On Sunday, July 1st, 2018, federal elections will take place through the whole country, while 30 of the 32 states will hold local elections (except for Baja California and Nayarit). Federal elections comprise the renewal of the Presidency of the Republic, the 500 members of the Chamber of Deputies and the 128 senatorial seats. A constitutional reform enacted in 2014 redistributed, within the federal State model, the political and electoral powers between the federation and the 32 states, and laid out the foundations for the shaping of an articulated and coordinated system for the organisation of elections around the country. …is ruled by a national law (the General Law on Electoral Institutions and Procedures, or LGIPE), which lays a number of common regulations and procedures to all elections, while setting aside regulatory spaces for the electoral legislation of the states to cover. …the sole responsible for all activities related with the organisation and management of federal elections, going from the review and adjustment of the electoral boundary delimitation (300 districts), to awarding the certificates that identify elected deputies and senators, including all elections’ management and logistics tasks. the management and assignment of the free airtime to which parties and candidates are entitled to on a permanent basis. Resolution of controversies and upholding justice in the electoral field is responsibility of permanent and specialised courts. The maximum authority in this matter is the Electoral Court of the Federal Judicial Branch, although state electoral courts also exist. All acts and resolutions by administrative authorities (INE and OPLEs) can be contested before the respective electoral court. Enacted in May 2014 as a result of, and in abidance with, the previsions of the constitutional reform passed earlier that year. Previsions related to the constitution and legal registry of political parties, as well as their rights and duties, with which both national and local parties must comply, are established in it. The registry of national political parties and the acknowledgement of their rights, and the access to their prerogatives. The control and oversight of the income and expenditures of all political parties and candidates to elective posts, the local kind included. The verification that those organisations with the intent of becoming national or political parties have the required amount of members, as established in each level, and that they fulfil the requirements of the corresponding law. The organisation of the election of the political parties’ leaders whenever an express request is filed, whose cost will be deducted from their prerogatives. The registry of local political parties and the acknowledgement of their rights, and the access to their prerogatives, as well as those of the candidates to local elective posts. At this moment, there are nine national political parties. They will take part in the elections on July 1st, 2018. The period for new national political parties to start the process for their registration will begin in January 2019. All political parties —whether national or local— and independent candidates to all elective posts are entitled to the prerogative of RECEIVING DIRECT PUBLIC FUNDING. For specific activities as organisations of public interest. It is permanent and is meant to support, directly and expressly, political education and training activities, and social and economic research, as well as the political parties’ editorial tasks. The General Constitution acknowledges the independent candidacies’ prerogatives of receiving public funding for their campaign expenditures. The terms under which this prerogative takes form for the federal and local elective posts is established, respectively, in the LGIPE and the states’ laws. The Constitution devises political parties as public interest organisations, and it is following this conception that they have access to the prerogatives of direct public funding and free permanent access to the radio and television, as well as additional funding and airtime during electoral periods. The Constitution also prescribes that public funding received by political parties must prevail (surpass) over the private one. During electoral periods, the prerogatives of public funding and free access to the radio and television are extended to independent candidates. It includes the contributions and individual compulsory fees, both ordinary and extraordinary, in cash or in kind, imposed by political parties to their members, as well as those that pre-candidates or candidates might, voluntarily and personally, contribute, exclusively, to their own pre-campaigns or campaigns. It includes the donations by Mexican citizens residing in the country made freely, voluntarily and personally, whether in cash or in kind during federal and local electoral processes. It includes income resulting from promotional activities, such as conferences, shows, games or raffles, cultural events, editorial sales and any other of the kind, made by political parties to gather funds. These are the profits from the accounts, funds or trusts that political parties can establish with financial institutions in Mexico for the investment of their liquid resources, which must be devoted to accomplish their objectives and are not protected by bank or fiduciary secrecies. Any public power, office or body of any level and under any circumstance. Foreign political parties and natural or judicial persons. International organisations of any kind. People living or working abroad. Likewise, the law bans political parties from asking development banks for credits to finance their activities, and from receiving donations from unidentified persons. These are the agreements two or more political parties subscribe to nominate common candidates to first-past-the-post (FPTP) elective posts (presidency, deputyships and senatorships), and which must be formalised before the appropriate electoral authority (INE, in the case of national political parties and for federal elections). A newly created political party must compete by itself in its first federal election right after its registration. Consequently, it can only take part of coalitions starting from its second participation in federal elections. Total: it includes all FPTP posts, that is, 300 deputies, 32 senatorship binominal formulas and Presidency of the Republic. In the case of elections for all federal elective posts, like the ones of July 1st, 2018, coalitions cannot be made just for one of the posts, for instance, only for the 300 deputyships or the 32 senatorship binominal formulas. Partial: at least half of the elective posts are included, which means it can have effects over not less than 150 of the deputies’ candidacies and/or 16 of the senatorship binominal formulas. Flexible: not less than 25% of the FPTP posts are included, that is, it can be limited to 75 deputyship candidacies and/or eight senatorship binominal formulas. Partial and flexible coalitions can be limited, if needed, to only one kind of election, which means that they do not necessarily have extended effects over other elections. In any case and during one electoral process, one political party cannot take part in more than one coalition. To ease both the collection of the support signatures and back-up documents needed by the applicants, and the verification process by the electoral authority, INE designed and implemented, for the federal electoral process, an application for smartphones. Even when the corresponding local electoral authority establishes the number of required signatures for each elective post and the period for their collection within their jurisdiction, the review and validation process of those signatures is INE’s responsibility. The applicants must present an income and expenditures report within 30 days after the conclusion of the period provided for the collection of citizen support. The pre-campaign stage or period is that during which political parties and their members, especially those who aspire to being nominated to an elective post, celebrate public events or rallies to make their proposals known and obtain the necessary support for their nomination. In any case, pre-campaign periods are related with the internal processes political parties conduct to choose or select, according with their own internal rules and procedures and the applicable legal previsions, their candidates to elective posts. Each state determines the duration of pre-campaign periods for their local elections, but there is a constitutional mandate that establishes they cannot last for more than two thirds of the period determined for their campaigns (which are, themselves, subject by constitutional mandate to minimal and maximal periods depending on the kind of election). In the case of federal elections, whenever the Presidency of the Republic and both Chambers of the Congress are renewed at the same time, as is the case in 2018, pre-campaigns cannot last more than 60 days, and if only legislative mid-term elections take place, they maximum duration is of 45 days. In any case, all political parties’ pre-campaigns must take place within the same period. Pre-campaign expenditures must respect ceilings, which are set in the electoral legislation of the corresponding jurisdiction. This is how the period between the deadline for internal processes for selecting candidates, or pre-campaigns, and the formal commencement of electoral campaigns, in their most conventional sense. Early campaign acts, such as public meetings or rallies, or the dissemination of propaganda promoting candidacies or calling people to vote, are prohibited during this period. Political parties are only allowed to disseminate general propaganda. This period includes those for the process of registration of candidates nominated by political parties, as well as, if that is the case, for those independents who might have fulfilled the requirements. The legislation for each territorial jurisdiction (federal and state) must also establish the periods and deadlines for the registry of candidacies for each kind of election. In the case of the 2018 federal elections, INE’s General Council has established that the registration process of all candidacies, whether presidential or legislative elections, and either partisan, of coalitions or independent, will take place between March 11 and 18, 2018. Electoral campaign is the set of activities political parties, coalitions and registered candidates can celebrate with the purpose of making their programmes, proposals and ideas known and try to convince the electorate and get their vote. Among these activities are, and the law makes a distinction between, conventional campaign acts, like public meetings, rallies or walks, and those of propaganda, which make reference to writs, publications, images, recordings, projections and expressions political parties, registered candidates and their sympathisers, to present and promote their candidacies before the electorate. Each state establishes the duration of local campaign periods, but a constitutional mandate dictates that they must be of 60 to 90 days for the governorship elections, and 30 to 60 days for local deputies and municipalities. In the case of federal elections, when the Presidency of the Republic and both Chambers of the Congress are renewed at the same time, as will happen in 2018, campaigns last 90 days, while during intermediate legislative elections the duration is of 60 days. In any case, campaign activities must conclude three days before Election Day. During that day and the three days prior, no electoral public meetings or campaign acts are allowed, nor is electoral or proselytistic propaganda disseminated. Propaganda disseminated by political parties, coalitions or candidates during a campaign is only restricted by the respect to the private life of candidates, authorities, third parties and the democratic institutions and values. Their propaganda must abstain from mud-slinging any person. 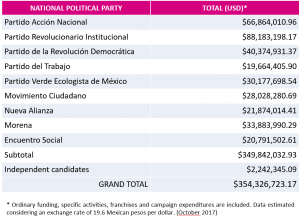 Expenditures disbursed by political parties, coalitions and candidates in campaign activities and electoral propaganda cannot surpass the ceilings set for each federal election by INE’s General Council. When it comes to federal elections, Mexicans living abroad who register as voters can vote for President and Senators. If stipulated in the state’s legislation to which their registration is bound, voters abroad can cast their vote in the local elections, particularly for governorships. In the 2018 elections, besides Mexico City, voters from Chiapas, Guanajuato, Jalisco, Morelos, Puebla and Yucatán will be able to vote for Governor. This means that voters from 7 out of the 9 states holding elections to renew governorships will be able to cast their vote (except for those from Tabasco and Veracruz). Voters from Jalisco will be able to, additionally, vote for local proportional representation Congress-members. Request their registration into the List of Voters living abroad (LNERE for its initials in Spanish) between September 1st, 2017 and March 31st, 2018. Receive their postal electoral package, starting on May 2018 and vote before June 30th, 2018. On February 2016, in collaboration with Mexico’s Ministry of Foreign Affairs (SRE for its initials in Spanish), INE set in motion a program to apply for, issue or, if that be the case, renew the photo voting card (whose validity is of 10 years) through the network of Mexico’s Embassies and Consulates around the world. Before that date, INE could only issue the photo voting card within the national territory. The request of the photo voting card to be either issued for the first time or renewed must be performed personally at the closest diplomatic or consular venue, for it is necessary to fill out the application form, take the citizens’ ten fingerprints and their photographs, and digitalise their identification documents, including their proof of address document. Once the administrative process is validated, INE is responsible for the issuance, shipping, and delivery of the photo voting card to the applicants’ address within a three-to-five-weeks period. Once the applicants have received their photo voting card, it is necessary that they activate it in order to vote or to use it as a valid identification document. Confirmation and activation may be done over the phone by calling INETEL (1(866) 986 8306 from the U.S. or +52 (55) 5481 9897 for the rest of the world), or through the Consultation System‘s website. For the 2018 elections, those who already have their photo voting card must express their voting intentions by registering on the List of Voters living abroad (LNERE), starting on September 1st, 2017 until March 31st, 2018. Registration may be made by accessing www.votoextranjero.mx or by downloading the VotoExtranjero App, available on Google Play. In any case, citizens must provide their general and contact information, and when applicable, images of both sides of their photo voting card and their overseas proof of address document. It is important to mention that those going through this process between September 1st, 2017 and March 31st, 2018, must no longer carry out the administrative process of registering in the LNERE, since the confirmation of reception of their photo voting card will automatically enable them to vote at the July 1st, 2018 elections. To exercise their right to vote, duly registered citizens will receive at their overseas address, throughout May 2018 via postal service package delivery, an electoral parcel with all the necessary documentation and materials. For security purposes, it can only be signed for by the registered person. All electoral packages will be sent out by INE, so they will be standardised so that the same kind of documents, materials, and information to vote for federal elections is supplied for local elections, whichever one it may be. For out-of-country votes to be counted, they must arrive to Mexico a day before the Election Day, which is Saturday, June 30th, 2018 before 08:00 hours. Therefore, voters must send back their envelopes with their votes, also through the postal service, before the due date. Reception of applications for obtaining or renewing photo voting cards and the transfer of such documentation and information to INE. Guidance to people on the necessary paperwork to request the issuance or renewal of their photo voting cards. Function as distribution hub of INE’s informative materials on out-of-country registration or voting. Foreigners interested in learning, taking part, witnessing, and being informed about the elections’ development throughout their different phases in any part of the national territory, have the opportunity to request, according to the bases and criteria issued by INE on the occasion of each electoral process, their accreditation as foreign visitors. For requesting the accreditation, basic requirements must be completed: filling out and signing of a format individually, and append a copy of their valid passport and a recent photograph. The formats are available at INE’s website, at its official venues throughout the country, and at Mexico’s diplomatic and consular representations around the world. The filled-in application format and the required documentation can then be handed in either personally, through the postal service, or by e-mail to visitantes.extranjeros@ine.mx, where additional information can also be enquired. The procedure to request the accreditation has been open since September 2017 and will conclude on the 20th of June, 2018. The legitimate demands and expectations of honesty, impartiality, transparency, and integrity throughout the electoral processes are attended by turning the guidelines, institutions and procedures that make up the Mexican electoral regime into a set of links capable of providing voters, competitors, and all stakeholders one solid chain of confidence. The permanent integration, updating, and filtering of the registry of eligible voters is an essential activity to guarantee the principles of universal suffrage, vote equity, and integrity of the electoral processes. Mexican legislation considers a series of procedures and actions whose express objective is the permanent updating and filtering of the three instruments that make up the electoral registry (electoral roll, photo voting card, and voters’ list), in such manner that, not only are their levels of precision, accuracy, and trustworthiness preserved, but even improved. Enrolment into the electoral registry is personal, permanent, and based on biometrical elements, and as of 2016, it can also be done at Mexico’s foreign diplomatic and consular venues. The photo voting card, which is produced and issued upon the validation of the registration application, includes sophisticated security features that guarantee its impregnability. The voters’ lists, which contain the names and photographs of all the enrolled citizens who have already got their photo voting cards, and are thus enfranchised, are printed out in a security paper fabricated specifically to prevent it from being falsified. With the purpose of having sharp indicators on the amount of coverage, accuracy, and consistency of the electoral tools, the Institute carries out, since 1994, periodic sample verifications. The results of the 13 audits that have already been conducted to date confirm their essential attributions: over the past 20 years, enrolment indicators, like that pertaining the issuance of photo voting cards, have shown a sustained growth. Specifically, during the last lustrum, enrolment rates have exceeded 97% of the voting-age population, and those pertaining issuance of the photo voting card, a 92% of the enrolled population. Direct public funding prerogatives and free access to radio and television for political parties and candidates, including independent ones, during campaign periods. Regarding political parties, both national and local, the previously mentioned prerogatives have a permanent condition. In any case, free access to radio and television is carried out through the State’s official airtime in all open-signal media outlets, which add up to approximately 1,700 radio stations and over a thousand television channels in the country. This disposition is complemented with the prohibition to purchase airtime or spaces in these media to spread electoral propaganda by any political party, candidate, legal or natural person. Limits to electoral pre-campaign and campaign expenses. On the occasion of each electoral process, electoral authorities have the legal mandate to determine campaign expense ceilings. Global and individual limits to donations made by militaries, candidates, and sympathizers, for campaign expense purposes. Prohibition on the dissemination of government propaganda, from the beginning of campaign periods until the end of the Electoral Day, except for that related to health, education or civil protection in cases of emergency. For the absolute impartiality and transparency in the process of integrating polling stations to be guaranteed and to, therefore, provide the vote reception process and first-hand counting of the casted votes during the Electoral Day with the utmost reliability, the selection of their members is made by a quite strict, sui generis system based on a double raffle among the registered voters who are residents of each of the smallest electoral area, known as section (all voters are registered and distributed by section, each of which is comprised by a minimum of 50 and a maximum of 3 thousand voters). The process guarantees that those citizens who will be in charge of running the polling stations receive the appropriate training by the National Electoral Institute, and that they fulfil the requirements of independence, skilfulness, and suitability to perform this transcendental responsibility. Ultimately, the process also ensures that those in charge of receiving and counting the votes at each polling station live in the neighbourhood and are familiar to their community. Not only are the citizens within each electoral section in charge of receiving and counting the votes, but the law recognise as an exclusive right of Mexican citizens that of participating as observers in the electoral processes throughout their development and along their different phases, which provides them with the opportunity of first-hand knowledge of all the activities and allows them to request from the authority all the information they deem necessary to present a well-founded, rigorous, and comprehensive testimony of the processes’ features and results. For citizens to participate as electoral observers, a timely request for their accreditation must me filed before the electoral authority, and they must commit to conduct themselves according to the principles of impartiality, objectivity, certainty, and legality, and without any ties with no political party, organization, or candidate. To promote and encourage this important activity, more specifically the projects from national observation groups, ever since 1994 and at each federal election process, public resources have been allocated for establishing a fund which is usually managed by the United Nations. Citizens from around the world interested in the knowledge, study, or analysis of the electoral processes in Mexico have the chance to, in occasion of each federal electoral process and according to the bases and criteria set by INE, request their accreditation as foreign visitors and, thus, learn and gain information about its development throughout its different phases anywhere in the country. Ballot papers are printed on a special paper which contains multiple security features to make them forgery-proof. Additionally, they are also geo-referenced in order to easily identify where they belong to; they are numbered and bound together as a receipt book, of which they can be effortlessly detached. Within the national territory, for voters to cast their vote, they must be present, as a general rule, at their corresponding polling stations according to the location of their residence. It is also essential that, with some rare exceptions, they carry their valid photo voting card, whose information must match that of the voters’ list at the polling stations. The voting booths where the voters mark the ballots have little curtains to guarantee the secrecy of the suffrage, while the ballot boxes in which they deposit their votes are entirely transparent. Once the voters have cast their vote, a mark is made to their voting photo card, while their right thumb is stained with a maximum efficiency indelible ink, which is specially fabricated for electoral purposes by a renowned national educational institution. This ink has even been exported upon the request of electoral bodies from other countries. A preliminary electoral results program that allows the electronic capture and public dissemination of non-definitive preliminary elections’ results, in a strictly informative manner and without any legal bindings. The results, that begin to be disclosed in real time through many outlets from the moment voting is closed in every polling station, proceed directly from the registered data on the counting and tallying certificates that are filled out at each polling station. Preliminary results may be consulted either as the aggregate of many levels, depending on the type of election, or from individual polling stations. To provide greater certainty about the truthfulness, accuracy, credibility, and integrity of the results, the filled-in and signed counting and tallying certificates of each polling station are digitalized and their images are simultaneously uploaded. Quick counts. The Institute was one of the first electoral authorities in the world to design and manage its own quick-count system so that it could offer a projection of the results of the elections within a few hours after the voting ends, sustained on the data recorded on the counting and tallying certificates, taken from a robust and highly representative sample of polling stations. It is a probabilistic exercise that tends to provide a high level of certainty, while having strict informative purposes. In 2018, besides Federal elections, INE has committed to carry out the quick counts for all governorship elections. It is important to point out that all data provided by INE through the preliminary results program and the quick counts, show in a systematic manner, a high level of correspondence with the results obtained from the official counting that holds legal value. The official aggregations of the elections, which start on the Wednesday following Election Day and are the ones that hold legal value, are based on the results obtained from the data contained on the counting and tallying certificates from each polling station. The territorial level at which the results are added up, federal elections begin at the 300 electoral districts, depend on the type of election. In any case, aggregation sessions at the different applicable levels are public and must comply with rigorous, clear, and precise procedures established by law, including those cases in which, on a district level, the counting and tallying procedure for single polling stations must be carried out again, or when does a total recount can take place either automatically or at the request of an interested party. The counting procedure can only be performed by the members —and their substitutes— of the collegiate directive body of the corresponding electoral authority (councils where representatives of the political parties and independent candidates are included), and the personnel of the professional electoral service specifically cleared to perform these tasks. However, not only can representatives from political parties and candidates present whatever objections they deem pertinent by properly registering them on the corresponding certificate, but they also have the right to impugn the count before the electoral courts. Following the amplification and strengthening of the prerogatives’ regime for political parties and candidates, a rigorous control system for the accountability, oversight and public transparency on the origins, management, and use of their public and private funds has continued to be conformed, whose guidelines and operation are INE’s sole responsibility, given that it comprises national and local political parties, independent political aspirants, pre-candidates, and candidates to all popular elective posts disputed in the country. 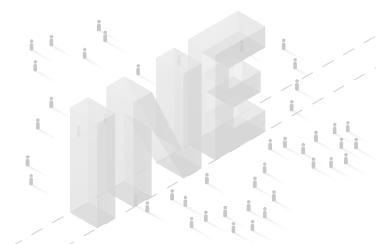 For the accomplishment of these objectives, INE has come up with an integral oversight system that allows the verification of the information reported by political parties and candidates through strict accountability, auditing, and collation mechanisms and procedures, supported on a technologic platform that demands the online registration of all operations within a period of three days after its fulfilment. The oversight procedure gives political parties and candidates the possibility to mend the errors or omissions identified by the authority. When performing its oversight attributions, INE’s General Council is not limited by bank, fiduciary or fiscal secrecy, and besides having the support of federal and local authorities, it is authorized to, and has already, subscribe collaboration agreements in matters of financial intelligence with the relevant unit of the Ministry of Finance and Public Credit. The Constitution mandates that no political party, whatever the voting percentage it may have garnered in the election for Federal Deputies, can have more than 300 seats out of the 500 that make up the Lower Chamber. This disposition ensures that no political party will have, on its own, a qualified majority (two thirds) of the votes needed to pass reforms to the General Constitution of the Republic. This way it is guaranteed that Constitutional amendments go through a negotiation process and agreement among different political forces. The General Council is INE’s supreme directive body, and is responsible for safe-guarding the compliance with Constitutional and legal previsions on electoral matters, as well as with its main guiding principles: certainty, legality, independence, impartiality, maximum publicity and objectivity. It is integrated by eleven members with the right to voice and vote. There is one President Councillor and ten Electoral Councillors, all of which must be elected by two thirds of the Lower Chamber through a public process in which their independence, experience, and professionalism are weighed. The General Council is also integrated by a variable amount of members with the right to voice but no vote: a representative from each national political party (currently 9) and councillors from the Legislative Branch (currently also 9), as well as the Institute’s Executive Secretary. The fact that all of the sessions of the General Council, their deliberations, stances and decisions are public and covered by the media, and streamed online, reinforces the guiding principles that must steer the performance of the President Councillor and the Electoral Councillors alike, who are the only decision-makers. Photo voting card. Besides being a requirement to be enfranchised, it has also become an official identification document for Mexican citizens. In Mexico, the objective of having one single national identification document has not been accomplished. In spite of the fact that the photo voting card issued by INE at no cost nationally, and since 2016 also internationally —for Mexican citizens living abroad, with the support of Mexico’s embassies and consulates throughout the world—, was initially conceived strictly for electoral purposes, not only has it practically become the main identification instrument for Mexican citizens, but it is also the one with the most coverage for Mexicans over 18 years of age. This situation cannot solely be explained by the multiple and sophisticated features this card contains, guaranteeing its impregnability, but also by the easiness for requesting and obtaining it, even abroad, and because of its high, almost universal, acceptability as an identification document in various institutions and establishments. Political parties are obliged to promote and guarantee gender parity in the nomination of candidates to popular elective posts to both Chambers of Congress, as well as for state Legislatures. This demand is applicable to all majority and proportional representation candidacies. In any case, the members of these tickets (both the candidate and its substitute) must belong to the same gender, and when it comes to integrating the lists, slates of different genders must be alternated to guarantee the parity principle. Moreover, for the upcoming 2018 federal elections, INE’s General Council has determined that at least two out of five of the political parties’ regional lists of candidates to the Chamber of Deputies must be headed by women and that the national list for the Senate must also be headed by a ticket comprised of women. The intent is to increase the percentage of women representation in Congress, which is currently of 42.4% (equal to 212) in the 500-member Chamber of Deputies and of 32.8% (that amounts to 42) in the 128-member Senate. INE undertook in 2008 the legal mandate of becoming the only authority to manage the State’s airtime under an internationally unprecedented and unheard-of archetype, whose main function was to materialize the prerogative of free access to radio and television, it being on a permanent basis for political parties and limited only to campaigns for independent candidates. To comply with these responsibilities, which, among other things, imply the reception and technical validation of advertisements submitted by political parties and candidates, as well as establishing timetables and distributing the slots in the nearly one thousand radio stations and 800 open television channels operating within the national territory, while efficiently supervising their transmission during the assigned times (representing a total of 41 minutes of the daily broadcast programming in each one of these channels as time slots of 2 to 3 minutes distributed throughout the entire day between 06:00 and 24:00), INE has designed, and currently runs, a permanent comprehensive system based on a network of sophisticated technological platforms.